This study investigates the degradation of imazapyr herbicide from wastewater by photocatalytic ozonation using TiO2 as a semiconductor. Effects of operational parameters on imazapyr removal efficiency including TiO2 dosing, initial herbicide concentration and pH were also studied. Obtained results showed that more than 90% of removal efficiency representing the disappearance of imazapyr was maintained until 7 µM in the presence of 200 mgL-1of UV100-TiO2. 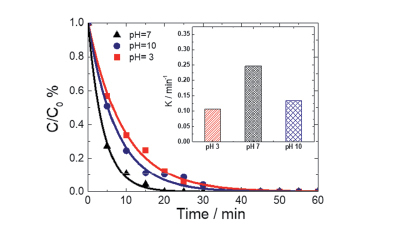 Otherwise, the degradation of imazapyr followed the first-order kinetics with a photocatalytic rate constant of 0.247 min-1, and complete degradation was achieved within 20 min using photocatalytic ozonation for 5µM of Imazapyr at pH 7.